Picture a dark venue. You hear a couple bars of your favorite song. And then a single guitar lights up. Out comes your favorite artist strumming a guitar that is lighting up the stage. Whether you’re playing around a campfire or in a dark music venue, having a guitar that can light up is sure to wow your audience. All you have to do is flip a switch to turn it on. Paint that can be wired to an electric current and produce light is extremely new. TD Customs is excited to offer light up guitars with this new technology. Guitars are the perfect medium. Light up paint will add entertainment value and give your performance an extra boost of intrigue. Lumilor is an electroluminescent paint system that can make any object light up with a real electric charge. It is a complex system of paint coatings that, when applied the right way, and when connected to an electric source, produce light. Lumilor acts as regular paint would in that we can apply it to various surfaces and shapes. A wire is connected to the paint, which can either be plugged in like a laptop or connected to a small battery pack. Lumilor is the base. After that, you can opt for a solid top coat color or a completely custom design that reflects your unique style. You may choose to have the entire surface area of the guitar light up, or only a few sections as accents. TD Customs offers light up paint jobs that include the electroluminescent paint and wiring, as well as the top coat paint design. The following guitar is completely lit, with a custom blue and white top coat with black swirl designs. 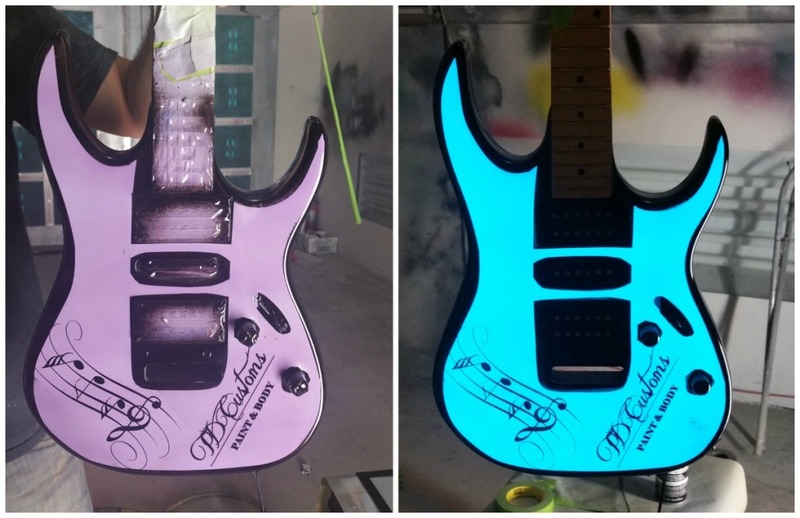 There are also different options for how you could design light up guitars to look both when it is on and off. When the Lumilor is on: Electroluminescent paint comes in blue, green, aqua, white and orange. We can work with certain top coats to achieve other colors, such as pink. When it is turned off: You can choose to have the Lumilor be completely invisible when it is off or choose to see those certain areas in a specific color. For example, when the Lumilor on the ‘Babydoll’ fairing is turned off, you still see the letters in grey. Light up the Stage with Lumilor! 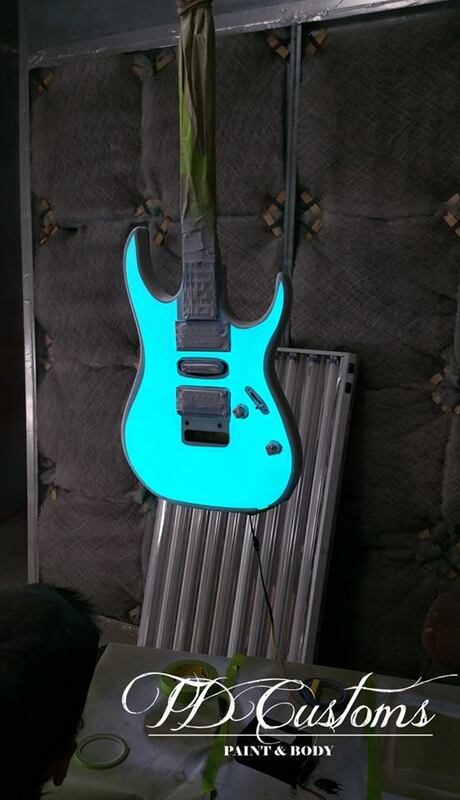 Let us know what your vision is for your light up guitar, and we can work with you to achieve it! See our Lumilor page for more information. 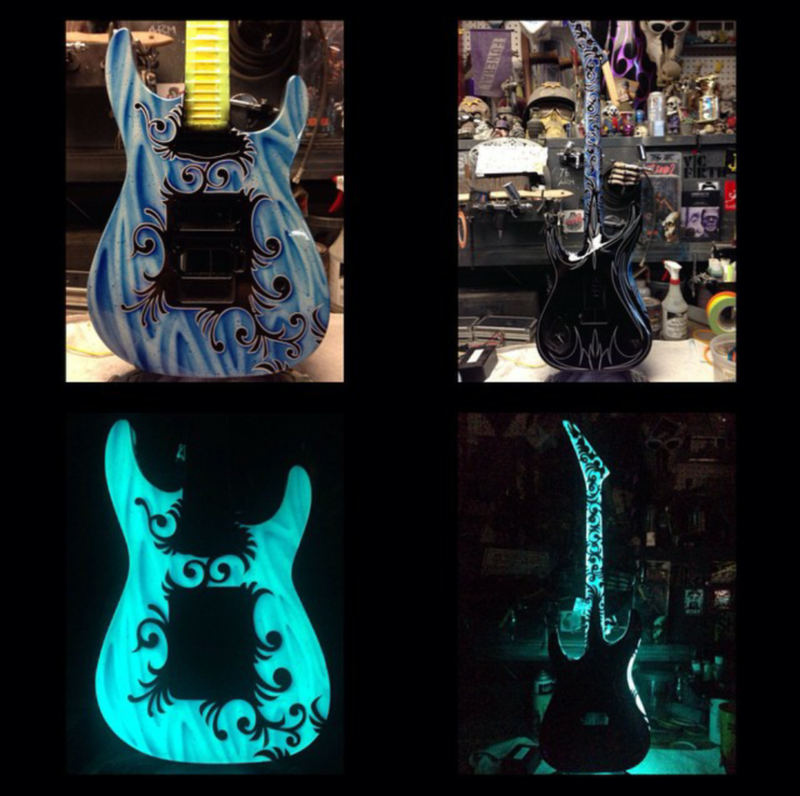 Fill out a Get Lit Request to get your guitar custom painted with the newest advancement in paint and light technology.